Cory Rises to a Packed House and iSpeech Silences - with Awe! Mayor Cory Booker - the media-centric next-generation mayor of urban regeneration -wowed a sold-out crowd with his story of reaching for more. As a former college basketball player and coach he told a story of getting his team members to reach out some more. When he offered an incentive, his team reached for even more. But when a short kid whispered that he deserved the prize, Booker laughed until the kid took him up on the roof. That’s reaching - and thinking out of the box. The kid won! This gala event - the first in a series that opens the iBreakfast and iEvening in its decade-long mission to find the next great business and match it to a long list of worthy investors - was the perfect example of where we are. Innovation abounds everywhere and big-league investors want to reach them. These companies have local attributes and they could use the publicity and sometimes, the help. Best of all, the iBreakfast is looking to partner with local influencers like Sperlingreene and the results are spectacular. This event with John Ason, Angel Investor (diapers.com); Stephen Brotman of GSA Venture Partners; Mike Segal of Joshua Capital, and Chris Fralic of First Round Capital found its star: iSpeech, a profitable provider of cloud-based speech technology and mobile apps will come to a NY iEvening and received an invitation to present at the prestigious Private Equity Forum in New York, to be held in June at New York’s Yale Club. We predict a VC feeding frenzy. One presenter waxed poetic about aneurisms and morbidity rates while the panel considered either throwing up or checking in at the hospital the next day, just in case. Another spoke about helping the digital conversation of medical records with great conviction and an overdose of detail until at the very end she noted there was a mandatory set-aside of $40K per doctor in the process. Talk about burying a lead! Best of all were the oldest start ups in our world - no one under 70! - who promoted their idea with umpteen Burma Shave-like signs and showed how their heat collector beat copper with a gangly display of copper pipe and sheeting. Their real story was their discovery of a high conduction plastic material. It could be huge. They just need the big city boost, a touch of youth and some of the 360 degree thinking we provide at our free, trademark “Power Pivot™ workshop. In short, they need the high interaction of an iBreakfast/iEvening. NEWARK, NJ, May 24, 2011 – A promising new venture based at the NJIT Enterprise Development Center in Newark was selected as the winner at iEvening New Jersey, an innovative new business event attended by more than 160 startup founders and entrepreneurs, and hosted by the New Jersey Institute of Technology, on Thursday, May 19th. The 4-hour conference included two workshops, networking, 14 exhibits and an investor pitching competition for start-up companies seeking investment capital. Newark Mayor Cory Booker, delivered a keynote address on innovation and business development at the event, and NJ startups presented competitive speed pitching presentations to a panel of high-profile, early stage investors. The event was produced by iBreakfast New Jersey, a venture of NJ marketing firm, Sperlingreene PR and Marketing, in partnership with New York-based iBreakfast. Attendees heard from a panel of early-stage investors about what they look for in companies in which they invest. The investor panel included: John Ason, Angel Investor, Stephen Brotman of GSA Venture Partners, Mike Segal of Joshua Capital, and Chris Fralic of First Round Capital. The winning firm, iSpeech, a profitable provider of cloud-based speech technology and mobile apps, received an invitation to present at the prestigious Private Equity Forum in New York, to be held in June at New York’s Yale Club. Sponsors of the MiniConference included NJIT, human resource specialist Ambrose, and the law firm Plata Forbes Ferrer & Gutierrez. Event organizers plan ongoing events and meetings sponsored by NJIT, that cater to the New Jersey small business community, including the 86 startup companies based at The NJIT Enterprise Development Center. iBreakfastNJ is an independent venture of Sperlingreene PR and Marketing in partnership with iBreakfast, the long-standing New York-based digital events organization led by Alan Brody. 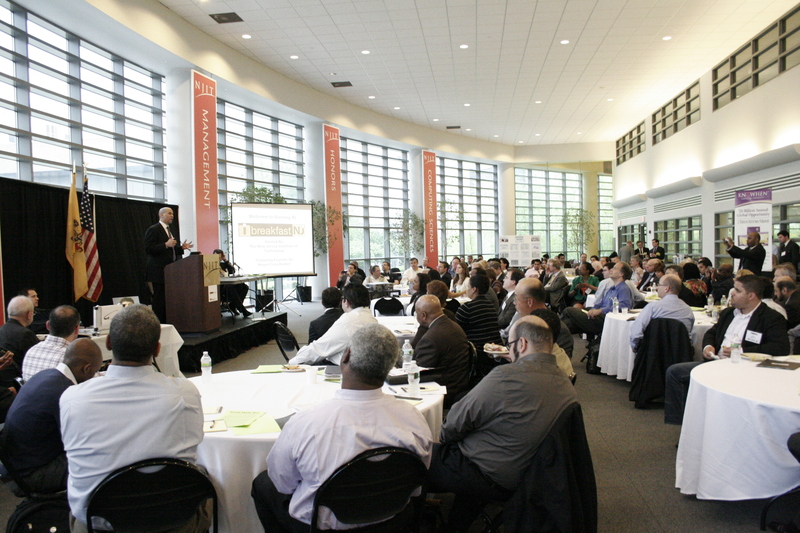 For additional information and dates of upcoming events, visit www.ibreakfastnj.com. Sperlingreene PR and Marketing is a communications, public relations and events management firm headed by Karen Sperling and Steven Greene. For additional information about Sperlingreene, visit www.sperlingreene.com. The Media loves them. The VCs have stars in their eyes and we like them too. But Cramer says the LinkedIn IPO was pure manipulation - right out of the dotcom bubble playbook: the underwriters do great, the VCs do well too but the founders mostly get the downdraft. Joe Nocera and Henry Blodgett say the founders got ripped off to the tune of $200 million - as if they sold their house for $1 million but in fact their broker resold it for $2 million. What are we to think? The secondary will tell!